Download "Mobile Banking and Mobile Deposit Terms & Conditions"
1 Mobile Banking and Mobile Deposit Terms & Conditions PLEASE CAREFULLY REVIEW THESE TERMS AND CONDITIONS BEFORE PROCEEDING: This Mobile Banking and Mobile Deposit Addendum ( Addendum ) to the Old National Bank Online Banking and Bill Pay Agreement between you and Old National Bank contains the terms and conditions governing your use of the mobile banking and mobile deposit capture services Old National Bank ( ONB, us or we ) may provide to you ( you, your or Customer ). Other agreements you have entered into with ONB, including the Online Banking and Bill Pay Agreement and the Deposit Account Agreement, are incorporated herein by reference. 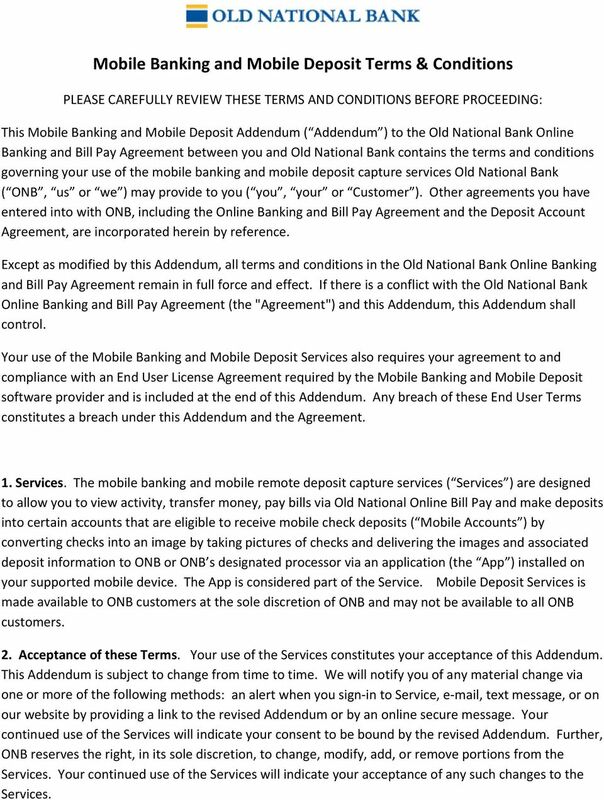 Except as modified by this Addendum, all terms and conditions in the Old National Bank Online Banking and Bill Pay Agreement remain in full force and effect. If there is a conflict with the Old National Bank Online Banking and Bill Pay Agreement (the "Agreement") and this Addendum, this Addendum shall control. Your use of the Mobile Banking and Mobile Deposit Services also requires your agreement to and compliance with an End User License Agreement required by the Mobile Banking and Mobile Deposit software provider and is included at the end of this Addendum. Any breach of these End User Terms constitutes a breach under this Addendum and the Agreement. 1. Services. The mobile banking and mobile remote deposit capture services ( Services ) are designed to allow you to view activity, transfer money, pay bills via Old National Online Bill Pay and make deposits into certain accounts that are eligible to receive mobile check deposits ( Mobile Accounts ) by converting checks into an image by taking pictures of checks and delivering the images and associated deposit information to ONB or ONB s designated processor via an application (the App ) installed on your supported mobile device. The App is considered part of the Service. Mobile Deposit Services is made available to ONB customers at the sole discretion of ONB and may not be available to all ONB customers. 2. Acceptance of these Terms. Your use of the Services constitutes your acceptance of this Addendum. This Addendum is subject to change from time to time. We will notify you of any material change via one or more of the following methods: an alert when you sign in to Service, e mail, text message, or on our website by providing a link to the revised Addendum or by an online secure message. Your continued use of the Services will indicate your consent to be bound by the revised Addendum. Further, ONB reserves the right, in its sole discretion, to change, modify, add, or remove portions from the Services. Your continued use of the Services will indicate your acceptance of any such changes to the Services. 3 h. Checks or items dated more than 6 months prior to the date of deposit; i. Checks or items on which a stop payment order has been issued or for which there are insufficient funds; j. 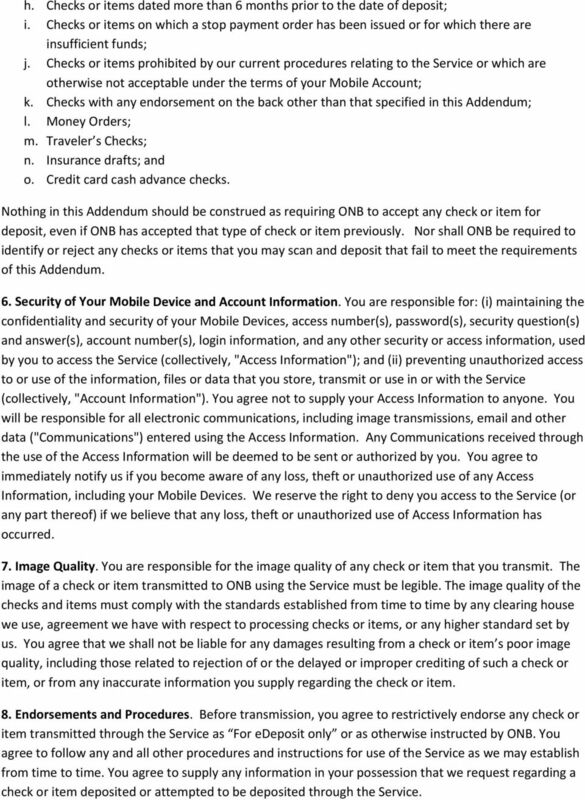 Checks or items prohibited by our current procedures relating to the Service or which are otherwise not acceptable under the terms of your Mobile Account; k. Checks with any endorsement on the back other than that specified in this Addendum; l. Money Orders; m. Traveler s Checks; n. Insurance drafts; and o. Credit card cash advance checks. 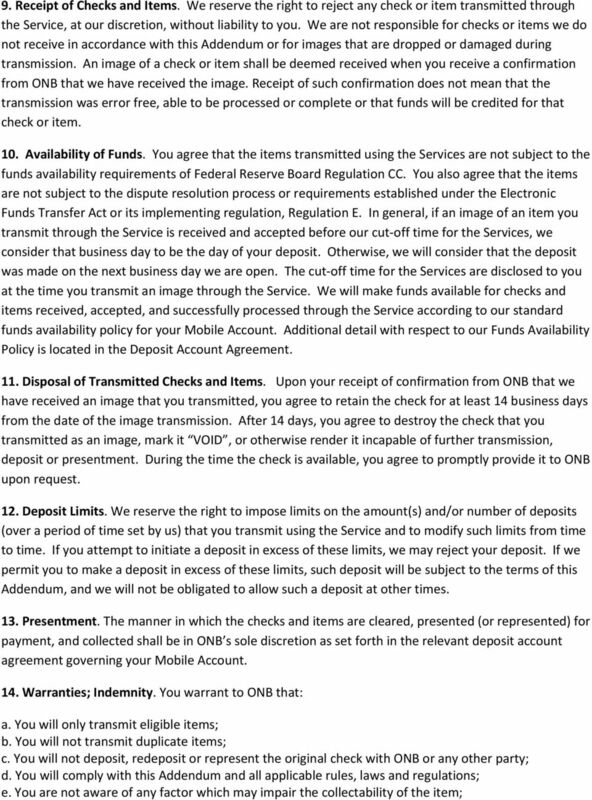 Nothing in this Addendum should be construed as requiring ONB to accept any check or item for deposit, even if ONB has accepted that type of check or item previously. Nor shall ONB be required to identify or reject any checks or items that you may scan and deposit that fail to meet the requirements of this Addendum. 6. Security of Your Mobile Device and Account Information. You are responsible for: (i) maintaining the confidentiality and security of your Mobile Devices, access number(s), password(s), security question(s) and answer(s), account number(s), login information, and any other security or access information, used by you to access the Service (collectively, "Access Information"); and (ii) preventing unauthorized access to or use of the information, files or data that you store, transmit or use in or with the Service (collectively, "Account Information"). You agree not to supply your Access Information to anyone. You will be responsible for all electronic communications, including image transmissions, and other data ("Communications") entered using the Access Information. Any Communications received through the use of the Access Information will be deemed to be sent or authorized by you. You agree to immediately notify us if you become aware of any loss, theft or unauthorized use of any Access Information, including your Mobile Devices. We reserve the right to deny you access to the Service (or any part thereof) if we believe that any loss, theft or unauthorized use of Access Information has occurred. 7. Image Quality. You are responsible for the image quality of any check or item that you transmit. The image of a check or item transmitted to ONB using the Service must be legible. The image quality of the checks and items must comply with the standards established from time to time by any clearing house we use, agreement we have with respect to processing checks or items, or any higher standard set by us. You agree that we shall not be liable for any damages resulting from a check or item s poor image quality, including those related to rejection of or the delayed or improper crediting of such a check or item, or from any inaccurate information you supply regarding the check or item. 8. Endorsements and Procedures. Before transmission, you agree to restrictively endorse any check or item transmitted through the Service as For edeposit only or as otherwise instructed by ONB. You agree to follow any and all other procedures and instructions for use of the Service as we may establish from time to time. You agree to supply any information in your possession that we request regarding a check or item deposited or attempted to be deposited through the Service. 6 REGARDLESS OF THE FORM OF ACTION OR CLAIM (WHETHER CONTRACT, TORT, STRICT LIABILITY OR OTHERWISE), EVEN IF ONB HAS BEEN INFORMED OF THE POSSIBILITY THEREOF. 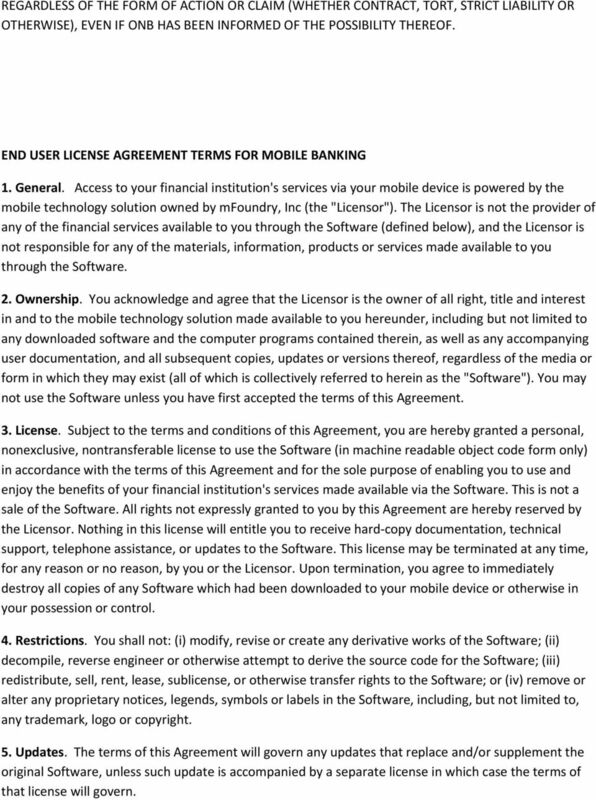 END USER LICENSE AGREEMENT TERMS FOR MOBILE BANKING 1. General. Access to your financial institution's services via your mobile device is powered by the mobile technology solution owned by mfoundry, Inc (the "Licensor"). The Licensor is not the provider of any of the financial services available to you through the Software (defined below), and the Licensor is not responsible for any of the materials, information, products or services made available to you through the Software. 2. Ownership. You acknowledge and agree that the Licensor is the owner of all right, title and interest in and to the mobile technology solution made available to you hereunder, including but not limited to any downloaded software and the computer programs contained therein, as well as any accompanying user documentation, and all subsequent copies, updates or versions thereof, regardless of the media or form in which they may exist (all of which is collectively referred to herein as the "Software"). 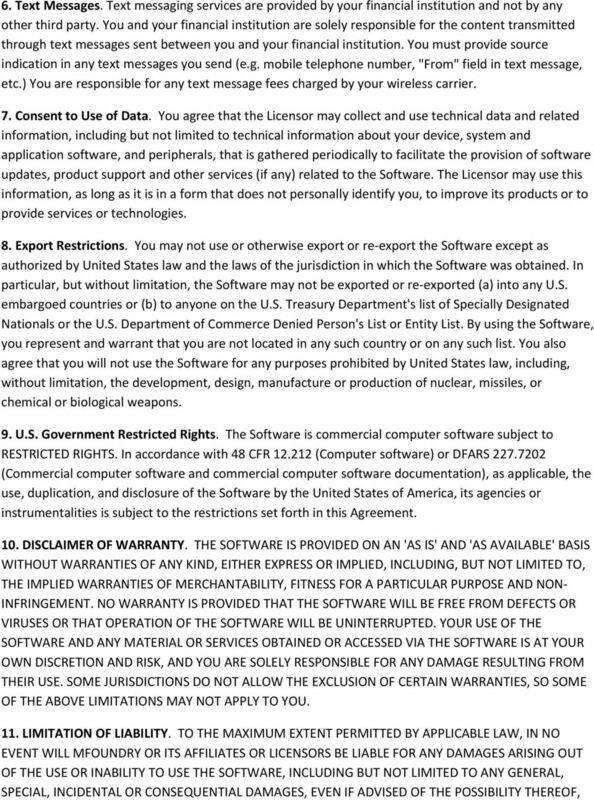 You may not use the Software unless you have first accepted the terms of this Agreement. 3. License. 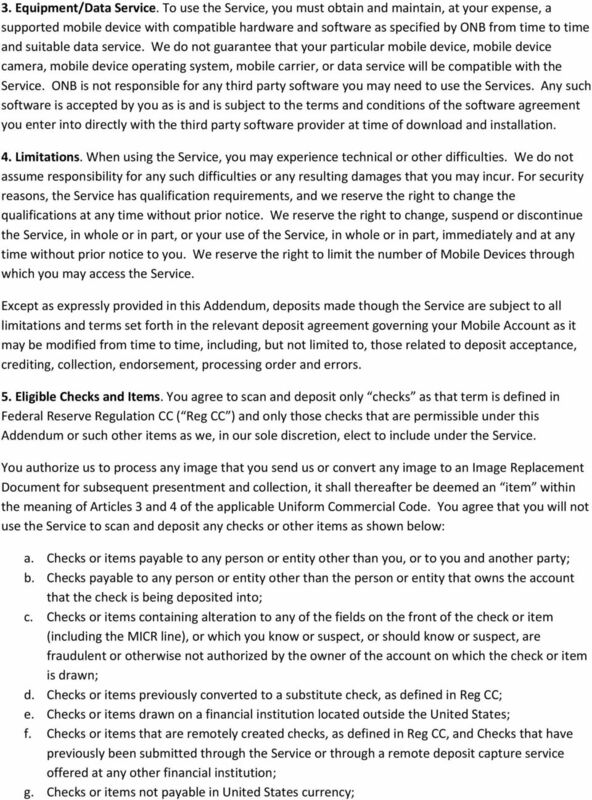 Subject to the terms and conditions of this Agreement, you are hereby granted a personal, nonexclusive, nontransferable license to use the Software (in machine readable object code form only) in accordance with the terms of this Agreement and for the sole purpose of enabling you to use and enjoy the benefits of your financial institution's services made available via the Software. This is not a sale of the Software. All rights not expressly granted to you by this Agreement are hereby reserved by the Licensor. Nothing in this license will entitle you to receive hard copy documentation, technical support, telephone assistance, or updates to the Software. This license may be terminated at any time, for any reason or no reason, by you or the Licensor. Upon termination, you agree to immediately destroy all copies of any Software which had been downloaded to your mobile device or otherwise in your possession or control. 4. Restrictions. You shall not: (i) modify, revise or create any derivative works of the Software; (ii) decompile, reverse engineer or otherwise attempt to derive the source code for the Software; (iii) redistribute, sell, rent, lease, sublicense, or otherwise transfer rights to the Software; or (iv) remove or alter any proprietary notices, legends, symbols or labels in the Software, including, but not limited to, any trademark, logo or copyright. 5. Updates. The terms of this Agreement will govern any updates that replace and/or supplement the original Software, unless such update is accompanied by a separate license in which case the terms of that license will govern. 8 AND REGARDLESS OF THE LEGAL OR EQUITABLE THEORY (CONTRACT, TORT OR OTHERWISE) UPON WHICH ANY CLAIM IS BASED. IN ANY CASE, THE LICENSOR'S LIABILITY ARISING OUT OF THE USE OR INABILITY TO USE THE SOFTWARE SHALL NOT EXCEED IN THE AGGREGATE THE SUM OF THE FEES PAID BY YOU FOR THIS LICENSE. SOME JURISDICTIONS DO NOT ALLOW THE LIMITATION OR EXCLUSION OF LIABILITY FOR CERTAIN TYPES OF DAMAGES, SO SOME OF THE ABOVE LIMITATIONS MAY NOT APPLY TO YOU. 12. Miscellaneous. This Agreement constitutes the entire agreement between you and the Licensor concerning the subject matter hereof. This Agreement will be governed by and construed in accordance with the laws of the state of California, excluding that body of laws pertaining to conflict of laws. If any provision of this Agreement is determined by a court of law to be illegal or unenforceable, such provision will be enforced to the maximum extent possible and the other provisions will remain effective and enforceable. All disputes relating to this Agreement are subject to the exclusive jurisdiction of the courts of California and you expressly consent to jurisdiction and venue thereof and therein. 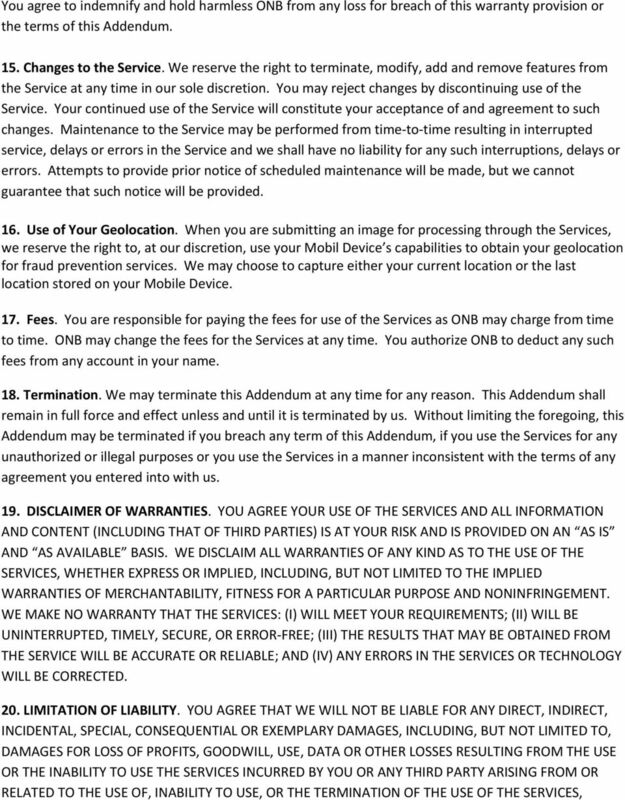 This Agreement and all related documentation is and will be in the English language. The application of the United Nations Convention on Contracts for the International Sale of Goods is hereby expressly waived and excluded. 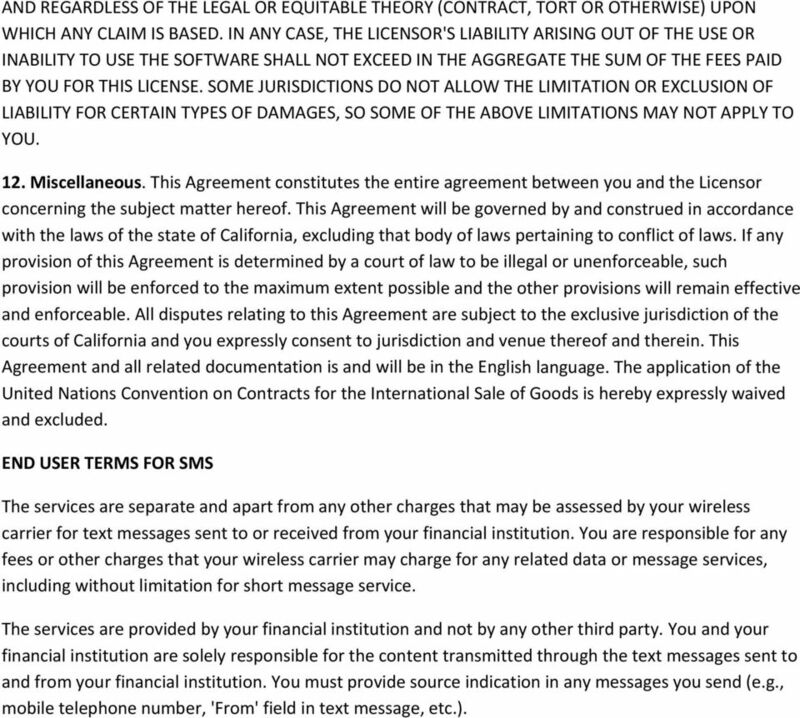 END USER TERMS FOR SMS The services are separate and apart from any other charges that may be assessed by your wireless carrier for text messages sent to or received from your financial institution. You are responsible for any fees or other charges that your wireless carrier may charge for any related data or message services, including without limitation for short message service. The services are provided by your financial institution and not by any other third party. You and your financial institution are solely responsible for the content transmitted through the text messages sent to and from your financial institution. You must provide source indication in any messages you send (e.g., mobile telephone number, 'From' field in text message, etc.). You may view and retain a copy of this Agreement through our website at: http://www.firstbanknj.com/personal-banking/online-banking.